(2) Work that used the work of McFadden to operationalise the Capabilities Approach for which you won the Nobel prize (Sen). I wish to make it clear that one author of the paper in question has already publicly acknowledged (2) above and given that McFadden’s work is (arguably) “more mainstream” in economics, the failure to acknowledge (1) makes the paper’s errors even more serious – at least, in the eye of economists. The paper in question is Beyond Happiness and Satisfaction: Toward Well-Being Indices Based on Stated Preference. Daniel J. Benjamin, Miles S. Kimball, Ori Heffetz, and Nichole Szembrot. Am Econ Rev. 2014 Sep; 104(9): 2698–2735. 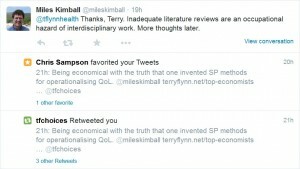 I mention above that I have already had a recognition by Miles Kimball (who, by reputation, is probably the senior author) of a lack of referencing of the work to operationalise Professor Sen’s Capabilities Approach. Yet, even if I were to accept “the “Sennian literature being often outside the mainstream economics literature” as a mitigating factor (which I do not), proposing a discrete choice model to elicit public values for elements of well-being is most definitely not “outside mainstream economics”. Of course your work on discrete choice models, Professor McFadden, is entirely “mainstream”. A friend/colleague of mine working in the “more mainstream” branches of economics considers my shock and annoyance entirely justified – she cannot believe the authors were unaware of the work of the team in which I worked from 2001-2015 to use stated preference discrete choice models to value elements of the Capabilities Approach. In terms of my reputation, and that of the wider group, I worked with Professor Jordan Louviere for many years and a textbook which we, together with Professor Tony Marley (acknowledged in Professor McFadden’s Nobel lecture) co-author is being published by CUP this month. 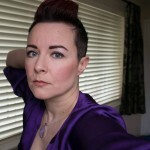 (Please see my google scholar profile for details of my publications). I do recognise and respect Professor Sen’s issues with putting numerical values on elements of Capabilities, but the “ICEPOP” team in which I worked has, I would posit, gone the furthest in providing a framework in which the importance of these can be valued, leaving the societal decision rule to be decided separately, by you Professor Sen, or others – please see numerous publications by Professor Joanna Coast and me. Anyway, our group has been the worldwide leader in marrying your respective approaches in order to value well-being and I consider it insulting, to say the least, that a paper in AER should appear, claiming that crown, when our papers have been available in reputable (and in some cases hardly non-mainstream economics) peer-reviewed journals for a decade. I make no request of you for further explicit action – I left academia several months ago, partly due to this kind of behaviour. I merely would ask that if further work by these authors or others, “passes by you or your colleagues”, you make them aware that valuing Capabilities using discrete choice models is well-progressed already and that they should be checking the publications of me, and the wider ICEPOP team. This entry was posted in Complete Blog, Economics, Surveys and tagged aer, capabilities, dces on 13 September, 2015 by Terry.